Episode 2×11 aired last week, so please add your user rating on IMDb, TV.com and SpoilerTV. Updates on the official Syfy website: Inside Dominion’ for episode 2×11, photo recap for episode 2×11, and more recap videos from episode 2×11 in the video section. There’s also a promo for 2×12 up on YouTube. 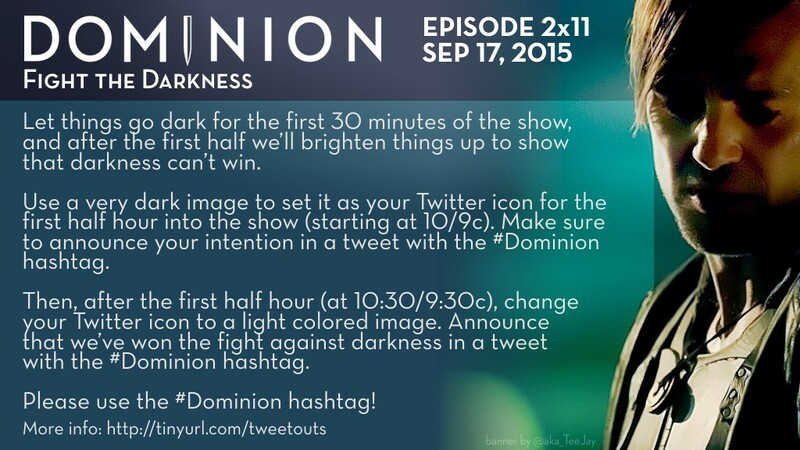 Syfy now also has a list of places where you can (legally) watch Dominion. Dominion: Revelations has chapter XI now activated. It’s about the Seven Wraths of God. We’ve added new stills from episodes 2×13. May be slightly spoilery, so proceed with caution. As per usual, we will be live tweeting with the cast again for episode 2×12 on Thursday. Our weekly theme will be “Wings for Noma”, we will be posting more details shortly. Please keep supporting the show by watching live and tweeting with us! Also, on Thursday our theme for the tweetout is Fight the Darkness. You can find more info in the banner or here on our website. Spread the word! Episode 2×10 aired last week, so please add your user rating on IMDb and TV.com. Updates on the official Syfy website: Inside Dominion’ for episode 2×10, photo recap for episode 2×10, and more recap videos from episode 2×09 in the video section. There’s also a promo for 2×11 up on YouTube. Syfy now also has a list of place where you can (legally) watch Dominion. Dominion: Revelations has chapter X now activated. It covers the hierarchy of the angels. We’ve added new stills from episodes 2×12. May be slightly spoilery, so proceed with caution. As per usual, we will be live tweeting with the cast again for episode 2×11 on Thursday. Stay tuned for more info on our weekly theme. Episode 2×09 aired last week, so please add your user rating on IMDb and TV.com, and also complete the SpoilerTV episode poll and also the Scene of the Week one. Updates on the official Syfy website: Inside Dominion’ for episode 2×09, photo recap for episode 2×09, and more recap videos from episode 2×09 in the video section. There’s also a promo for 2×10 up on YouTube. Dominion: Revelations has chapter IX now activated. It covers Arika and her role in Helena. We’ve added new stills from episodes 2×10 and 2×11. May be slightly spoilery, so proceed with caution. Vaun Wilmott did another Periscope chat last week. The video is up on YouTube. 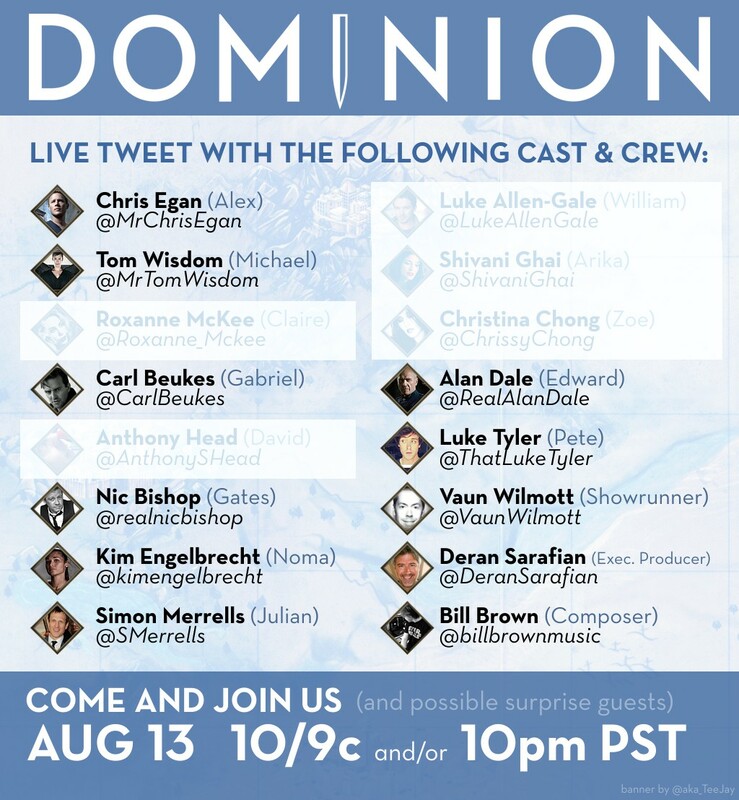 Last but not least, we will be live tweeting with the cast again for episode 2×10 on Thursday. This week we’re encouraging you to post a selfie of yourself in a hoodie — archangel-style. More information in the banner or here. 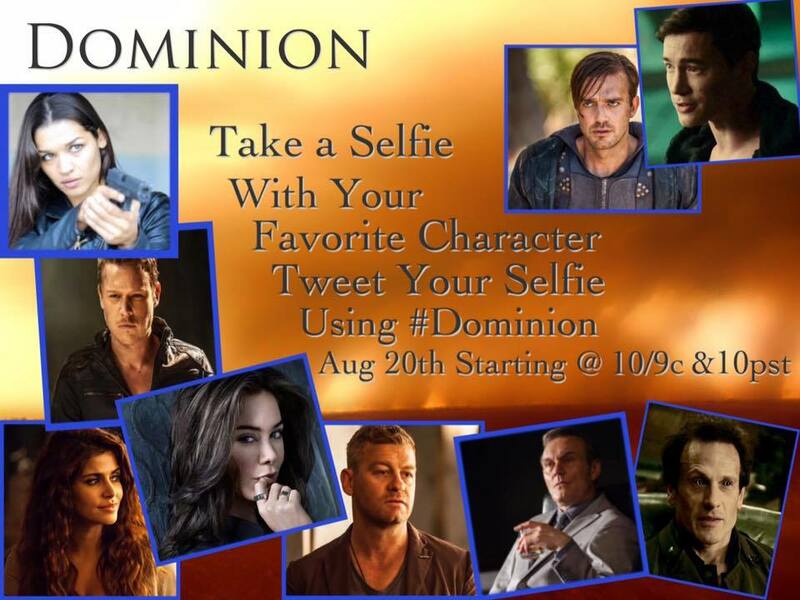 On Fri, Sep 4 at 8/7c tweet “#RenewDominion because” and add your reason why you think the show deserves a 3rd season. 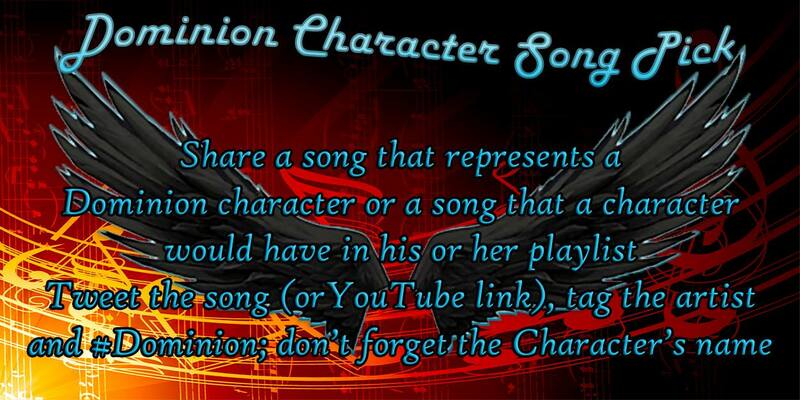 Tag @SyfyTV or @DominionSyfy in your posts and fill it with the reasons you love the show, the characters, the music and all the great moments the show has given you for the last two years, or anything else you can think of. If you want, you can additionally tag the actors or the writers and production team or anyone from the cast and crew you like. A list of all the relevant Twitter handles can be found here. 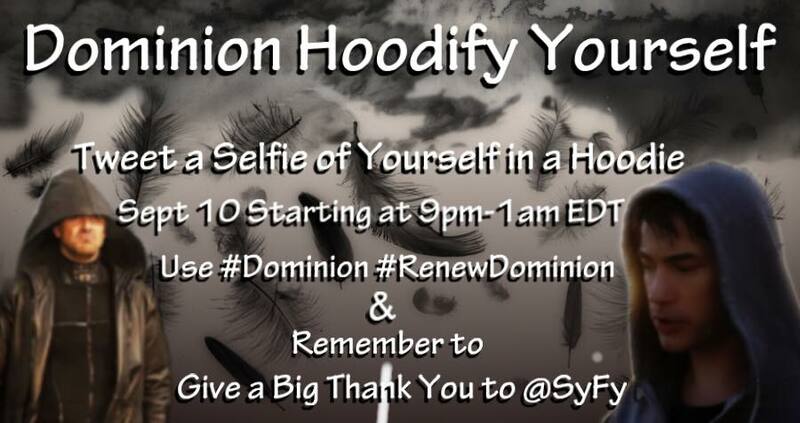 Don’t forget the #RenewDominion tag! Please spread the word so we can get a great turnout! Episode 2×08 aired last week, so please add your user rating on IMDb and TV.com, and also complete the SpoilerTV poll. Updates on the official Syfy website: Inside Dominion’ for episode 2×08, photo recap for episode 2×08, promo for episode 2×09, more recap videos from episode 2×08 in the video section. Dominion: Revelations has chapter VIII now activated. It covers life in New Delphi. We’ve added new stills from episodes 2×07, 2×08 and 2×09. May be slightly spoilery, so proceed with caution. Vaun Wilmott joined the Afterbuzz TV folks for an in-depth discussion of episode 2×07. The 50-minute video is up on YouTube. 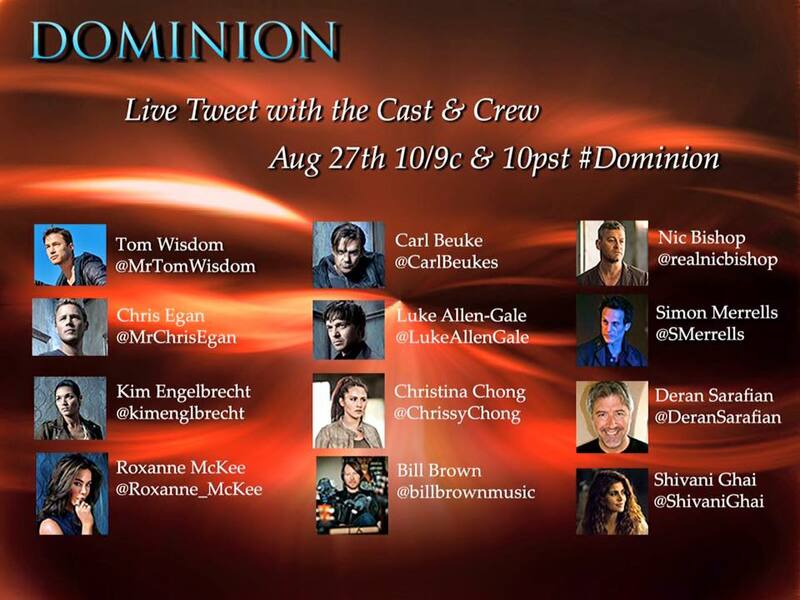 Last but not least, we will be live tweeting with the cast again for episode 2×09 on Thursday. This week we’re encouraging you to share a song that you feel represents a certain characters, or that a character on the show might enjoy listening to. More information in the banner or here. Are you ready for tomorrow’s tweetout? Here’s our guest list for the live tweet. We hope you join us! As usual, the tweetout starts at 9/8c and continues all through the episode. Episode 2×05 aired two days ago. Did you like it? As usual, it’d be great if you could add your user rating on IMDb and TV.com, and also complete the SpoilerTV poll. Updates on the official Syfy website: ‘Inside Dominion’ for episode 2×05 (alternative links: Hulu – Dailymotion), photo recap for episode 2×05, promo for episode 2×06 (alternative link: YouTube), sneak peek for episode 2×06 (alternative links: Hulu – Dailymotion), more recap videos from episode 2×05 in the video section. Dominion: Revelations has chapter V now activated. It covers one of the founding fathers of Vega: Gates Foley. We’ve added new stills from episode 2×07. May be slightly spoilery, so proceed with caution. There’s a few more behind-the-scenes photos we added to the gallery that Vaun Wilmott and others posted on Twitter. 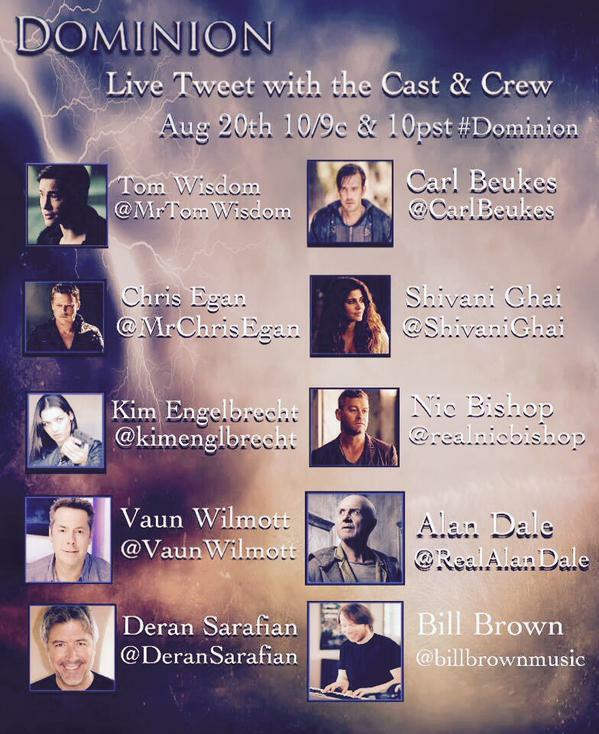 We have two more Dominion related interviews: NerdSpan Bill Brown Interview & The Guardian Anthony Head Interview. Last but not least, of course we’ll be live tweeting again on Thursday. More on that to follow soon.